Our new baby—the KUB® 250 System—is the highest resolution low dose portable digital X-ray system dedicated for the NICU (Neonatal Intensive Care Unit). Unlike most other systems that have to decrease their resolution to reduce radiation dose, making image quality inadequate, the KUB® 250 System is the world’s first portable DR system with 96 micron pixel size and radiation dose up to 40% lower than other available systems. 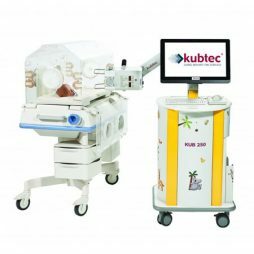 Reduce risk of infection with the nimble, NICU-dedicated, mobile KUB® 250 System. The system is small enough to fit beside and between incubators, powerful enough to offer the highest resolution (96 micron) images, and gentle enough to offer low dose imaging for our tiniest patients. The system’s CMOS detector slides into the incubator without having to move the infant, and produces the highest resolution, high contrast images in seconds at the very lowest radiation levels. The system features a touch screen monitor, articulating arm for decubitus view, integrated patient ID barcode scanner, rapid image acquisition, zero warm up time, and auto calibration, reject analysis and exposure index tools. Multiple images can be sent wirelessly to PACS with a single click—with or without annotation. Where space is at a premium and efficient, high quality images are the goal, the digital XPERT® 20 System is the solution. This self-contained, shielded cabinet X-ray system provides core biopsy and stereotactic biopsy specimen imaging. The system offers feature-rich, user-friendly software in a small cabinet that takes up less real estate than a PC. With zero warm-up time, the XPERT® 20 System offers AEC (automatic exposure control), auto-calibration, automatic window leveling and the ability to send multiple images, with annotations to PACS. A small focal spot X-ray source provides increased visibility and sharpness of detail. With an X-ray source of up to 25kV and 1.0mA, the XPERT® 20 System provides images with the highest resolution to locate the smallest detail. Designed for use in the most limited spaces with complete shielding and other radiation safety features, the XPERT® 20 System is fully compliant with U.S. Federal and State requirements for radiation safety and operates with only a standard AC power source. Ease of operation, safety and the ability to acquire, annotate, print and send images to PACS in the shortest amount of time makes the XPERT® 20 System the ideal tool for specimen radiography in the biopsy suite. 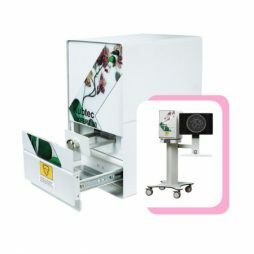 Easy to use, this mobile, self-contained, shielded cabinet X-ray system is designed to meet imaging requirements for surgically excised core tissue and stereotactic biopsies. The XPERT® 40 System eliminates scheduling conflicts in Mammography and reduces time in Surgery for intra-operative imaging of specimens. The XPERT® 40 System also has applications in Pathology for inspection of tissue specimens and wax blocks. The XPERT® 40 System provides high resolution, high contrast, X-ray images, using either radiographic film, CR, or the DIGIVIEW™ line of digital detectors up to 8 x 8 inches (20 cm x 20 cm) in size. A small focal spot x-ray source and adjustable sample positioning provides the XPERT® 40 System with up to 5X magnification increasing visibility and detail of the smallest abnormalities. An x-ray source of up to 50kV and 1.0 mA provides easy penetration and eliminates the concerns of imaging dense surgical tissue in any specimen container. The XPERT® 40 System has zero warm up time, AEC (automatic exposure control), auto-calibration, and the ability to send multiple images, with annotations, to PACS. Included with the standard DICOM compliant feature-rich software is the proprietary Artemis feature from Kubtec® that offers the unprecedented ability to view excised tissue with digital mammography quality. The touch screen monitor and mobile cart option make the XPERT® 40 System an easily maneuverable and user friendly unit offering the flexibility to meet the demands of every application. 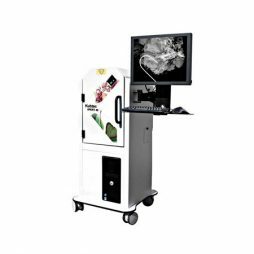 When the demands are for versatility and high resolution imaging, look to the XPERT® 40 System from Kubtec, The Leader in Digital Specimen Radiography Systems. With its complete shielding and other required radiation safety features, the XPERT® 40 System is in full compliance with US Federal and State requirements for radiation safety.